Garage Kits: Prices, components, delivery and discounts. Overview of garage kits and their prices with all metal components, hardware, dimensions and delivery. 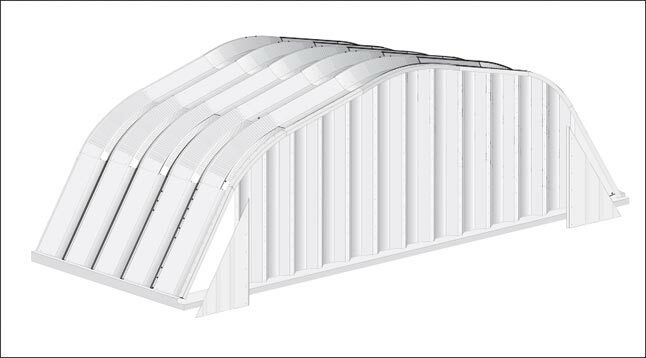 This is how we price out your quonset style steel arch building kit. The Metal Building Kings metal garage kit or steel building kit is made up of a quonset style pre-engineered arch metal building system. The building price is based on the size, gauge steel and number of components thats are manufactured at our factory and then according to your building’s specifications we ship out the prefab metal garage components that you will construct and erect to complete your garage kit. First, each building model (P, Q, S and A) its priced out differently because of the style of the arches. So for instance the S and Q model will carry a different cost than the P and A Model. But each model has the same components that go into forming the building and final price. So lets figure out what the price of a 20 foot wide X 12 foot high X 20 feet long P model metal garage would cost based on these example prices. The prices do not include the foundation or any add on accessories such as custom ventilation, skylights, or custom end wall doors etc. This is the price of the metal garage kit itself. 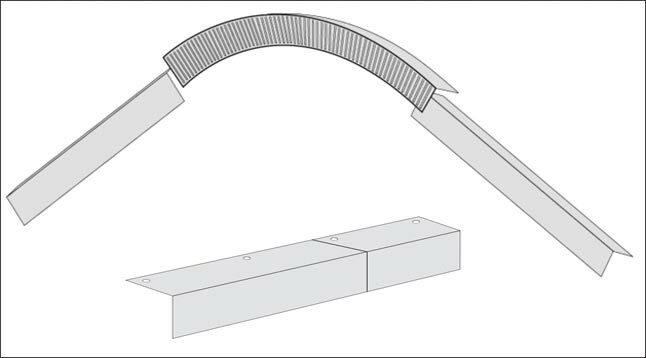 The price of each arch is determined by the width and height of the building that the 7½" deep corrugated galvalume steel arches will form multiplied by the number of arches you will need to form the length. 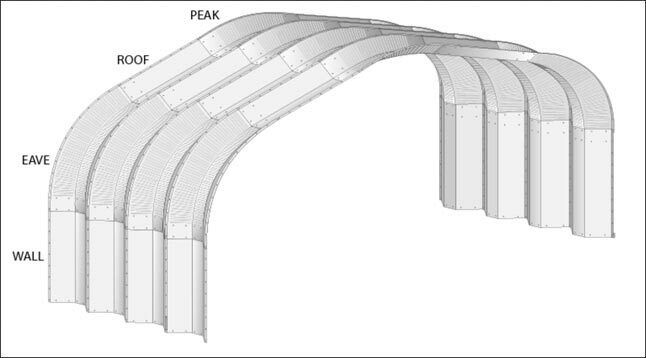 Each P Model arch is comprised of 4 segments - The peak, Roof, Eave and Wall. When these 4 segments are attached together you get one complete arch. Each assembled arch represents 2 feet in length. The length is the depth of the building which can go as long as you want in increments of two feet. So the number of arches you need for a 20 foot long garage kit is 10 arches. If the price of the each 20 foot wide and 12 foot high arch costs $189 each then the price of the arches is $3,780. The steel curved trim angles are needed to trim the ends of the metal garage kit and used to attach the end walls. Each garage kit has two angles, one on each end of the building. The price of the angle is determined by the width and height of the building arches which determines the amount of steel needed in constructing the angles. If each angle for this size building costs $69.00 then the price of the angles is $138.00. Base plates are used to secure the steel garage kit to the cement foundation that underneath the building. There is one base plate for every two feet, or for every arch the building has. The base plate eliminates the use of tie-down brackets also reduces the size of the steel building foundation. So for this size garage kit that is 20 feet long, divide that by 2 feet and you get 10 base plates for each side of the building. So that is 20 total base plates. If each base plate costs $25.00 then the total price of base plates is $500.00. The end walls are the walls on each end of the building. Your building comes with standard walls that are easily attached to the garage kit. End walls can have several types of doors that you can choose from and are separate from the cost of the walls. If you have the front open such as in some truck storage garages or agriculture buildings then you would only need one end wall. In this case lets say we want to have the building closed up on both ends so we will have two end walls. For this size building, lets say each end wall would cost $603.00. So the total price of end walls is $1,206.00. Each building’s shipping costs depends on size, weight and distance. Metal Building Kings bills you our cost to ship each garage kit to you at the most economical and most secure way. So lets say for a building of this size the price of shipping is $1,206.00. At Metal Building Kings we always can beat the best price of any other garage kit seller for the same exact materials and components. If you take a look at our online garage kit price calculator or discount price calculators on our discounted buildings page you can build and price out your steel building and we will let you know if we also have your building already made with deep discounts. So if this building was on sale your price could be dropped dramatically. Here are prices on metal garages with discounts displayed. Our prices average $674.00 - $1,921.00 less than all other quonset hut steel arch metal garages on the market in the United States.